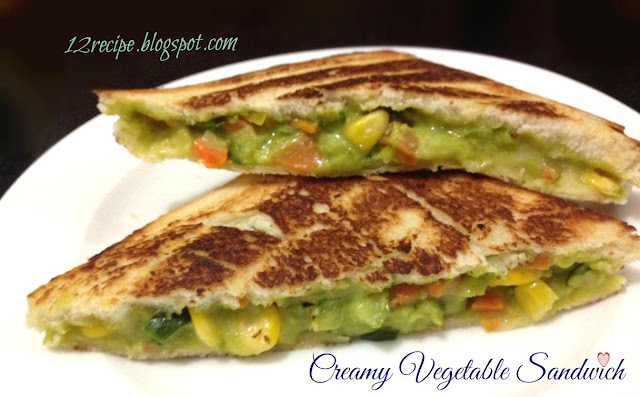 Creamy vegetable sandwich is an easy delicious and healthy snack recipe that can prepare within few minutes. When you taste it once; you will surely fall in love with this recipe. Add the choice of your vegetables and do start making this wonderful mixed vegetable sandwich. Chop the washed spinach leaves. Cook it on a non-stick pan for two minutes until soft. In a blender add this spinach and fresh cream; blend in to a smooth paste. Heat a pan with 1 tbsp of butter or oil; add the chopped vegetables. Saute for about 3-5 minutes until the raw taste goes. Add chopped cucumber, tomato and palak puree in to it. Mix well and quickly switch off the flame. Mix it with grated mozzarella. Take one bread slice and add a thick topping of filling in it. Cover it with another slice of bread. Press little to tighten. Make the remaining two sandwiches in this way. Now by applying butter on each sides grill it for 5 minutes on both sides until golden. Or heat a pan with butter and toast the both sides until golden in color. Using a sharp knife cut the sandwich in to diagonal pieces. NOTE: Instead of spinach; you can use one avocado; puree it and just mix with the fresh cream. Or use avocado itself and avoid fresh cream.